Saddam Hussein was the infamous President of Iraq from 1979 to 2003 until US military apprehended him. In 2006, he faced trial for crimes against humanity and was sentenced to death. 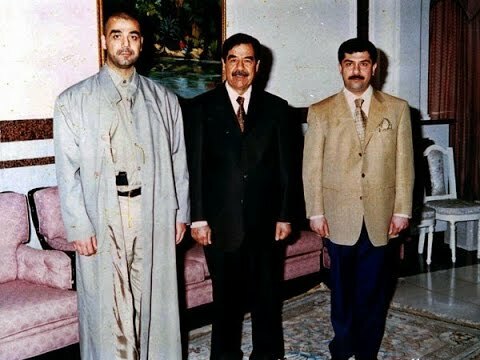 Hussein’s eldest son, Uday Hussein, reportedly had a falling out with his father, despite Uday’s position as successor to the Hussein regime. The eldest son was internationally known for his unstable personality and numerous criminal allegations - which included assaults against women, the use of archaic forms of punishment, and fatal attacks on family members and enemies alike. Uday and his brother Qusay died in 2003 when special operations Task Force 20, in conjunction with the US Army, besieged a hideout in Mosul, Iraq. The 2011 drama The Devil’s Double presents an adaptation of Latif Yahia’s 1994 true crime novel of the same name. Yahia, a former classmate of Uday, describes how he was enlisted to function as Uday’s body double - a dangerous position that required he make public appearances as Uday. Although some journalists reject the former soldier’s claim, Yahia went on to publish several more texts about his experiences in Hussein-ruled Iraq. Uday is portrayed as a blood-thirsty tyrant with no regard for human life - and as a man and ruler whom the people of Iraq greatly feared. The accounts also detail how Uday was fixated on his appearance, a behavior which caused the public to view him as both dangerous and eccentric. In his novel The Devil’s Double, Latif Yahia depicts how bodyguards seized women for Uday Hussein’s personal use. He maintains how the guards often assaulted the abductees as well. If Uday laid eyes on a woman he desired, he’d reportedly order his henchmen to kidnap her right off the streets and take her to his private chambers. If the women tried to report the incident, the guards would terminate them at their boss’s command. Uday’s infamous legacy includes attacks on women, regardless of age or consent. Uday attended a wedding at Baghdad's Hunting Club in the late 1990s without an invitation. Reportedly, right after Uday left the hall, the bride vanished. Uday’s bodyguards blocked the doors, and the groom pulled out his pistol. He died from a self-imposed gunshot. Uday abducted another bride in 2003. He had the 18-year-old forcefully brought to one of his guardhouses. A maid witnessed Uday's man rip the woman's dress off and lock her up. After Uday arrived, the woman’s cries reportedly became screams. The maid was later summoned to clean up the room. A bodyguard threatened her to silence: "Don't say anything about what you see, or you and your family will be finished." When Uday served as the head of the Iraqi Olympic Committee, he had athletes who didn’t meet his performance standards locked up and beaten. Soccer players were caned on the soles of their feet and instructed to kick a concrete ball. Uday reportedly incited such punishments when the team didn’t make it to the 1994 FIFA World Cup finals. After Uday’s death, a member of the Iraqi national soccer team revealed the extent of Uday’s abuse. Habib Jaafer maintained Uday employed tactics of humiliation, such as shaving the men’s heads or spitting on them, in addition to the physical abuse of beatings and electric shocks. The uprising against Saddam after the first Gulf War was not without consequences. According to Yahia, Uday paid a visit to the Shia prisoners and had half of them eradicated. Then, he told one prisoner that he wouldn’t die as quickly. Uday reportedly pulled out a drill and plunged it into the man’s skull. The remaining prisoners were left in their cells with the dead as a form of psychological torture. Those who survived were released only to spread the word of what they witnessed to scare other Iraqis and prevent future uprisings.